What more could you want from a concert put on by surrealist director David Lynch than an array of spectacular, dramatic and downright weird performances? 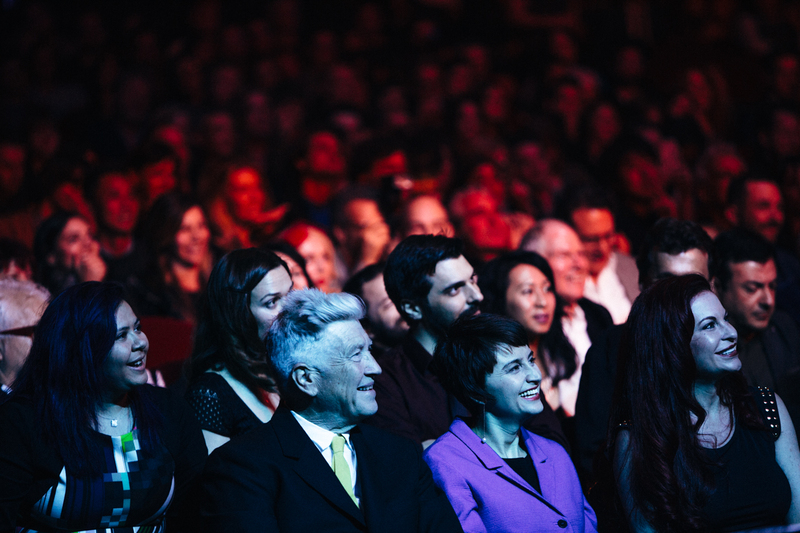 The Music of David Lynch benefit concert on April 1 featured all this and more, while celebrating the 10th anniversary of the David Lynch Foundation and educating us about the benefits of meditation. 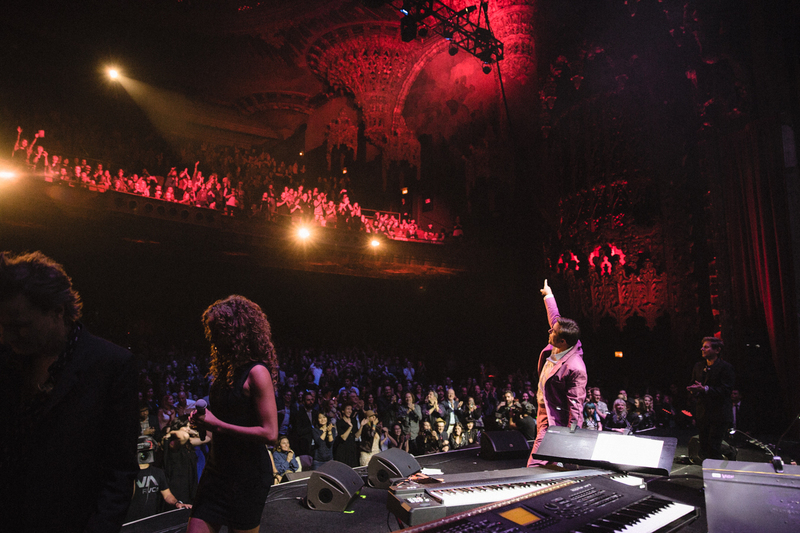 The sold-out concert at the Theatre at Ace Hotel in downtown Los Angeles featured a motley list of performers spanning genres and generations including Duran Duran, Moby, Wayne Coyne and Stephen Drozd of Flaming Lips, Karen O of Yeah Yeah Yeahs, Jim James of My Morning Jacket, Sky Ferreira, Donovan, Lykke Li and many others. The evening kicked off with a gorgeous rendition of the shimmering “Laura Palmer’s Theme” by the house band led by Angelo Badalamenti, the renowned composer who scored several of Lynch’s projects including Blue Velvet and the Twin Peaks series. Then Donovan’s warbly, slightly off-key vibrato on “Love Me Tender” — the Elvis Presley tune featured in Lynch’s Wild at Heart — left some audience members scratching their heads, but it seemed very Lynchian in its strangeness. Looking dapper in an evening jacket, My Morning Jacket’s Jim James sang “Sycamore Trees” from Twin Peaks. 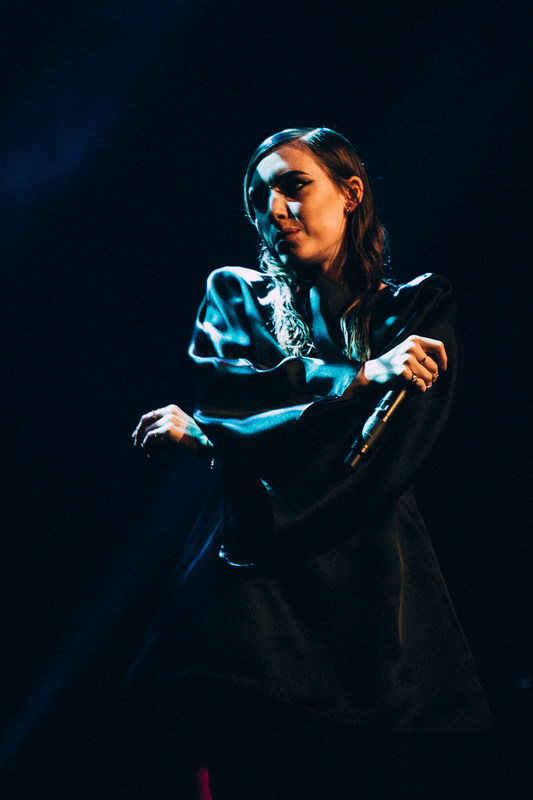 Swedish songstress Lykke Li lucked out by getting to cover the gorgeous “Wicked Game,” and her unique, passionate delivery was a refreshing take on the Chris Isaak tune that Lynch’s 1990 film, Wild at Heart, helped make famous. 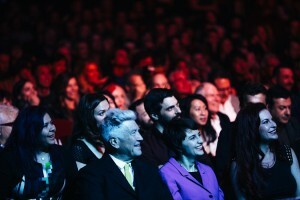 Lynch himself mainly stayed out of the spotlight during the show, but that didn’t stop the performers from expressing their praise and admiration for him. Moby stopped to tell the crowd that his famed song, “Go,” was not just inspired by Lynch. “That last song I just stole,” he said. In what was by far the strangest and most surreal set of the evening, Flaming Lips’ Wayne Coyne and Steven Drozd performed the “Soundscape from Eraserhead” and segued into an ominous piece from Elephant Man. Coyne told the audience that he incorporated sounds into the piece from a construction site across the street from the Ace Hotel that woke him up at 4am. The performance was at once abrasive (many people put their fingers in their ears), beautiful and quintessentially Lynchian. Not surprisingly, Duran Duran didn’t disappoint with their set that closed out the night. Rather than playing tunes from any of Lynch’s multiple projects, they busted out their own jams – “The Chauffer,” “Ordinary World” and “Hungry Like the Wolf” — much to the delight of the packed house, especially the female contingent who screamed and danced in the aisles when the British rockers took the stage. Frontman Simon Le Bon reminded the crowd that they collaborated with Lynch on the 2014 concert film, Duran Duran Unstaged, and said that Lynch’s film, Eraserhead, was groundbreaking for kids like them growing up in a small town in England during that time. “David really is all about making the world a better place and bringing people together,” he added. Before the concert began, David Lynch Foundation Executive Director Bob Roth told the audience that Lynch has never missed a meditation practice in the 41 years he’s been meditating, sitting twice a day to “go deeper” so he can “catch the big fish.” He also screened an NBC news clip about the Foundation featuring students, veterans and an array of celebrities including Jerry Seinfeld and Russell Brand that illustrated the benefits of meditation, including decreased stress levels, increased school attendance, significant reduction of violent behaviors and more. Go here to learn more and to make a donation to the David Lynch Foundation.